London 2012: “Greenest Games ever” or “Most sustainable ever” breaches of air quality laws with EU and IOC legal action? The Campaign for Clean Air in London (CCAL) is writing to obtain a commitment now from the Government, on behalf of itself and the whole Olympic Family in the United Kingdom (the UK Olympic Family), in relation to the London 2012 Olympic Games and the London 2012 Paralympic Games (London 2012). The commitment is that they will take all necessary actions to ensure that London 2012 will, at an absolute minimum, comply sustainably and fully with the letter and spirit of all applicable UK and European Union (EU) air quality laws and the Host City Contract for London 2012. ·the planned new EU Directive on air quality will require all applicable efforts to be made to meet NO2 obligations by January 2010 with a likely requirement to rectify any residual breach as soon as possible thereafter and absolutely by January 2015 (i.e. less than 28 months after the end of the 2012 Paralympic Games). London 2012 offers the promise of a “One Planet Olympics” as “the Greenest Games ever”. This means complying with air quality laws, which represent an absolute test of achievement and greenness, not breaching them then and thereafter in “the most sustainable ever” way. CCAL urges you therefore, as the Minister responsible, to grasp the obvious opportunity and confirm the UK’s commitment to deliver the “greenest and most sustainable Games ever” by complying fully with air quality laws and EU Limit Values for NO2 by London 2012. CCAL invited each of the four main London Mayoral candidates to make these commitments and their responses are included in this letter (see pages 3 and 4). Please reply personally to this letter – particularly given the personal commitment shown to this issue by London’s political leaders. Respectfully, the Prime Minister and you could not receive a louder or clearer call for the Government to take urgent action in respect of London’s air quality. London 2012 offers a wonderful opportunity for the UK to deliver a spectacular and memorable event and to showcase its many achievements to the world. To underpin this vision, the UK Government, the Mayor of London and the BOA (British Olympic Authority) have undertaken to the International Olympic Committee (IOC) to carry out their obligations and activities under the Host City Contract in a manner which embraces the concept of environmental sustainable development, and which complies with applicable environmental legislation and serves to promote the protection of the environment. Despite this opportunity and the associated commitments, CCAL has seen no evidence yet that the Government has any plans for London by 2012 to: meet current and/or expected EU legislation for air quality in London; comply with the terms of its guarantee that “all work necessary for the planning, construction and operation of facilities for the Olympic Games will be fully compliant with local, regional and national regulations, international agreements and protocols in relation to environmental protection”; or deliver the “Greenest Games”. On the contrary, the evidence today shows ongoing breaches of EU Limit Values for NO2 in 2010, 2015 and 2020. The Government clearly lacks the political will necessary to improve London’s air quality. Beijing 2008 is constantly in the news about its air pollution (which is up to three times the maximum level recommended by the World Health Organisation (WHO)) despite the major efforts being made by the Chinese Government to meet air quality standards for the 2008 Olympic Games and 2008 Paralympic Games. With air pollution in some of London’s busiest streets being well over twice the maximum level recommended by the WHO, the UK (particularly as a developed country) has its own serious air pollution problem. However well China does over the next few months, air quality will be remembered now as a sensitive, health and media issue for all future Olympic Games and Paralympic Games. Fail embarrassingly in its much reported ambition to deliver the Greenest Games. Please bear in mind also that climate change is likely to require bolder action much earlier than would otherwise be necessary. The European Environment Agency stated recently that meteorological factors are already having an adverse impact on air quality of between 15% and 25% for particulate matter (PM10). The Government and the UK Olympic Family must aim meaningfully ahead of climate change not offer flimsy excuses later for not foreseeing these already expected changes. Plan now or fail, yet again, later. CCAL intends to press the European Commission and the IOC to use robustly the full weight of their respective legal and other powers against the Government to force the UK to comply fully with all its air quality obligations. Furthermore, by putting the Government and the UK Olympic Family on notice now of the relevant issues, CCAL considers that any embarrassment caused to the UK or its Olympic Family in late 2011, early 2012 or thereafter, will have arisen solely from their failures rather than CCAL’s actions. CCAL has copied this letter to the Prime Minister given the cross-cutting departmental issues involved. CCAL wrote to the previous Prime Minister on 23 December 2006 inviting him to “Pledge [his] support to the cross-party Campaign for Clean Air in London which aims to achieve urgently World Health Organisation recommended standards of air quality throughout London”. Despite an acknowledgement dated 5 January 2007 indicating that the letter was receiving “attention and a reply would be sent as soon as possible” and occasional follow up requests by CCAL including a letter to the (new) Prime Minister dated 17 December 2007, which was also acknowledged promising a reply “as soon as possible”, CCAL has still not received a reply to its original letter. 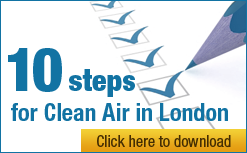 CCAL launched a wholly separate petition to the Prime Minister on air quality in March 2007 which has been well supported by many of London’s political and community leaders and others. Given the seriousness, urgency and scope of the issues raised in this letter, CCAL has copied this letter also to the most senior members of the Olympic Movement and relevant others. CCAL has received the following comments from the four main candidates for Mayor of London for inclusion in this letter. They are shown first from Mayor Livingstone (out of respect for the office of Mayor of London) and then in alphabetical order. Mayor of London Ken Livingstone said: “Tackling environmental pollution is a top concern and air quality is a key issue within that. I want to improve London’s air quality to the point where pollution no longer poses a risk to human health. I have introduced initiatives to improve air quality across London, including the Low Emission Zone which starts on 4th February. “The Olympic Games and Paralympic Games in 2012 promise to be superb sporting festivals, but they will fail if they do not leave a positive lasting legacy. It must be our aim that, instead of doing the bare minimum, the Games act as a catalyst for wide-ranging change. Just as we want them to set new and improved standards in access for people with disabilities, they should do the same for environmental policy. The Campaign for Clean Air in London has only one aim which is to achieve urgently at least World Health Organisation (WHO) recommended standards of air quality throughout London. Most of these have been required to be met since 1999 legislation by January 2005 for particulate matter (i.e. PM10) and by January 2010 for NO2. CCAL has received support from the Mayor of London, leading politicians from the four main political parties in London and all the amenity societies in Central London as well as leading business groups including the Central London Partnership, London First and The Knightsbridge Business Group. It has also received a Pledge of support from Environmental Protection UK (formerly the National Society for Clean Air and Environmental Protection) and the Alliance Against Urban 4×4’s. CCAL’s campaign website address is shown in the letterhead above. Incorporate specific references to measures addressing sensitive segments of the population such as children. The UK faces the possibility of infringement action by the European Commission in respect of air quality at several stages over the next four years if it continues to fail to meet its legally binding obligations. Of greatest potential impact on the London 2012 Games is the likelihood, if legally binding obligations have not been met by then, that infringement action will be taken in late 2011 or early 2012 for breaches of PM10 obligations. This may lead to one or more judgements by the European Court of Justice against the UK as a Member State in respect of London as a “specific location” (or otherwise) with very substantial fines, negative publicity and considerable public concern. “We welcome the European Commission’s action on breaches of the current air quality directives. The infraction proceedings on SO2 [sulphur dioxide] have no direct impact on London’s air quality but have sent a strong message to government that healthy air is important and air quality must be improved. CCAL is pleased to see such a forthright stance from the Mayor of London and his Principal Policy Adviser – Air Quality. Some of the most important future air quality obligations in the new EU Directive will require the UK to meet, as soon as possible, standards that were set in 1999 in the current air quality directives to be met by January 2005 for PM10 and January 2010 for NO2. CCAL has written therefore to the European Commission urging it to take the most robust action against the UK as a Member State for any breaches of air quality obligations as perhaps the only means of getting central Government to take seriously its air quality obligations and to support London in its efforts to improve air quality. The new EU Directive is due to be implemented in mid-2008 replacing some four current EU Directives and a related Council Decision. If the new EU Directive is delayed or not duly implemented for some unexpected reason, CCAL will be pressing the European Commission to take infringement action urgently under current EU legislation to force the UK to meet legally binding obligations for PM10 for which no time extensions have been allowed since 1 January 2005. Against the background of air quality being seen as one of the top issues facing the Beijing 2008 Olympics, a front page global exclusive, published by John Higginson in the Metro newspaper on 3 September 2007 and titled “Pollution puts Britain in the dock”, has provided an excellent example of the profile that this issue is likely to have if the Government fails to meet its legally binding air quality obligations. As an example of the Government’s failings in this area, please note that the Department for Transport (DfT) has failed to approve yet a scheme for the certification, testing and registration of retrofitted vehicles for the abatement of emissions of nitrogen dioxides (NOx) from older vehicles. In explaining to CCAL that this is because it is “technology neutral”, the DfT is clearly still befuddled by the Government’s focus solely on cost-benefit analysis and failed to understand the need to meet legal obligations for air pollution (for which it is jointly responsible with the Department for Environment, Food and Rural Affairs (Defra)). Mayor Livingstone has cited the lack of a national NOx abatement scheme as a reason for his not including a NOx standard in the forthcoming Low Emission Zone in London. CCAL does not accept the DfT’s intransigence, or the impasse seemingly reached with the Mayor Livingstone on the issue, as any grounds for the UK failing to meet its obligations under EU air quality legislation. The DfT assured CCAL on 16 January 2008 that it is looking again into this issue and will respond formally to it. With the above example and others, CCAL intends currently to press the European Commission to oppose vigorously any time extension being allowed for the UK if it fails to comply fully with its obligations to meet EU Limit Values for NO2 by January 2010 since the Government has shown no plan or reasonable efforts yet to meet these obligations by that date. Indeed, it is clear that the Government will need to demonstrate action beyond that agreed in its Air Quality Strategy if it is to achieve full compliance with EU Limit Values for NO2 i.e. the Government has no actions planned yet to comply with current or prospective air quality laws. Within that Candidate File, London 2012 submitted Volume 1, Theme 5: Environment and meteorology with Paragraph 5.7 on page 84 “Environmental compliance guaranteed”. “The UK Government, the Mayor of London and the BOA [British Olympic Authority], as stakeholders in the LOCOG [London Organising Committee of the Olympic Games] and controllers of the Olympic Delivery Authority, guarantee that all work necessary for the planning, construction and operation of facilities for the Olympic Games will be fully compliant with local, regional and national regulations, international agreements and protocols in relation to environmental protection. In CCAL’s considered view, if UK does not comply fully with its legal obligations under the new EU Directive on air quality in London and other participating UK Olympic cities, it will also have breached the Environmental Protection undertaking and the Environment Compliance Guarantee both given to the IOC. Furthermore, it may already be in breach of these obligations as a result of the Preparation for the Games e.g. at locations with heavy traffic from Olympic construction sites. CCAL urges the IOC to look closely at these issues now. The Government promised to deliver the Greenest Games in 2012. CCAL has seen some subsequent backtracking from this obligation which it considers to be wholly unacceptable. The London Development Agency said in a press release dated 16 November 2004 that “an unprecedented agreement between London 2012 and leading environmental groups is being signed today, signifying a public commitment to making a London Games the greenest ever. “We want to ensure London 2012 is remembered not only as two weeks of fantastic sporting action but also as the “greenest Games in modern times”. The Commission for Sustainable London it its press release dated 15 May 2007 stated that it was “set up to independently monitor London’s pledge to host the most sustainable and greenest Games to date”. In the “Five Legacy Commitments” document, published by the Greater London Authority on 9 January 2008, Commitment Four is “Delivering a sustainable Games and developing sustainable communities”. On page 17 it expands on this to say: “Social, economic and environmental sustainability is at the heart of the London 2012 Games and the future plans for regenerating East London. The Games provide a perfect opportunity to demonstrate, through construction and legacy, how we can change behaviours and manage our resources to ensure a better quality of life for everyone now and for future generations. The detailed objectives shown on page 27 of the Appendix for Commitment Four do not include any for compliance with air quality laws. CCAL urges those concerned to include such an objective in future similar publications. “London 2012 is a once-in-a-lifetime opportunity to improve society and transform the lives of millions. Despite apparent confusion amongst the UK’s Olympic Family as to whether the commitment to the IOC was for London 2012 to be “the Greenest Games ever”, “the Greenest Games in modern times”, “a Green Games” and/or “the most sustainable Games ever” it is clear that London 2012 has committed itself to the highest environmental standards. CCAL urges the Government and the whole UK Olympic Family to take their commitments seriously and to recognise that they extend across the breadth of the London’s environmental performance, including air quality, and to deliver on their commitments. Finally, it will be necessary, given the boldness of London’s commitment to deliver the “Greenest Games”, to judge its environmental performance at a minimum against all the Summer Olympic Games held since the Second World War. These include those in Helsinki (1952), Melbourne (1956), Munich (1972), Montreal (1976), Barcelona (1992) and Sydney (2000). Lord Coe’s Think keynote address in May 2007 referred to earlier highlighted specifically many of the sustainable green achievements of those earlier Games which have set many very specific benchmarks for London 2012 to achieve. CCAL met representatives of the Commission for Sustainable London 2012 on Wednesday 9 January 2008. In that meeting, CCAL highlighted particularly the opportunity (and need) for London to comply sustainably with air quality laws as part of the “Preparation, Staging and Legacy” of London 2012 after the challenges facing Beijing 2008. CCAL highlighted also the legal requirement to meet all the EU legal obligations for PM10, and most or all of those for NO2, by January 2012 and commented that “most sustainable ever” would be a worthless achievement if it refers to breaches of air quality laws. Table 1.12 on page 52 of the strategy document shows that some 319,000 people in London are expected in 2010 to be exposed to levels of NO2 over the EU Limit Value of 40 μg/m3 with 157,000 people in 2015 and 155,000 people still in 2020 i.e. there is no plan currently to comply with air quality laws by 2020. Air quality laws require these standards to be met by January 2010. Under the forthcoming legislation, the Government will be able to apply for time extensions, under strict conditions, from 1 January 2010 to 1 January 2015 only. A separate Freedom of Information request to Defra discovered that some 9,871 people in London are expected in 2015 to be exposed to levels of PM10 above the level allowed for daily exceedances of the EU Limit Value. Air quality laws required these standards to be met by January 2005. Under the forthcoming legislation, the Government will be able to apply for time extensions, under strict conditions, until the end of 2011 only. The UK needs new plans and programmes if it is to comply fully with current or prospective air quality laws. When the political will existed in the past, air pollution was tackled quickly whether as the ozone layer, leaded petrol or acid rain. Therefore, in CCAL’s considered view, all that is needed now is for the Prime Minister to insist that the UK will comply fully with air quality laws. If you are worried about air pollution, please email the Ministers responsible for air quality at [email protected] and [email protected] telling them about your concerns and ask them to press the Prime Minister for such a commitment. Alternatively, please sign the petition to the Prime Minister at (link no longer available) before 13 March 2008. It really is that simple. In retrospect, it is clear what seems to have happened. The Government, from the Prime Minister down, committed to deliver the greenest and most sustainable ever Olympic and Paralympic Games for London 2012 in their enthusiasm to host them. The Government knows now however that without identifying and implementing successfully new measures to improve air quality that London is due to be in breach of air quality laws in 2010, 2015 and 2020. The Government is therefore trying to backtrack on its commitments to deliver the greenest Games and is instead now trying to focus attention on delivering the most sustainable Games (which is an ambiguous commitment). Londoners need the Government to stand by its commitments, including its obligations to ensure compliance with air quality laws, and take action now to deliver the greenest and most sustainable ever Olympic and Paralympic Games. Given the lead time involved in implementing the necessary changes, London needs new plans in place in 2008. London 2012 offers a tremendous opportunity for the UK to host a successful and memorable Games that will set a new benchmark for all future such events not least in terms of environmental sustainability. Air quality will be a key measure of London’s success in 2012 not least after the issue has been given such a high international profile by the challenges faced by China for Beijing 2008. It would not be an over-estimate to say that air pollution could become the defining memory of Beijing 2008. Will it be the same for London 2012? The UK has an appalling air quality record. In 2007, it was one of only five countries in the whole EU to be subject to infringement action by the European Commission for breaching legally binding air quality obligations for sulphur dioxide (SO2) in 2005. It is still possible that the European Commission will launch infringement action in 2008 against the UK, in respect of London as a “specific location”, for breaching similar legally binding air quality obligations for PM10 since 2005. Furthermore, according to an article in the Financial Times dated Monday 7 January 2008, the UK has received a second written warning (the last step before resort to the courts) from the European Commission for breaching the Large Combustion Plants Directive. For these reasons, CCAL recommends that air quality should be one of the top environmental issues being considered and addressed fully by those planning for London 2012. The Government has largely now run out of “silver bullet” solutions to the chronic air pollution problem that require others, such as industry, to fix the problem e.g. through technology improvements or the most sustainable biofuels. The Government must accept finally that the most cost effective solutions require it: first to find and demonstrate the political will that is needed to lead substantial behavioural change in respect of all aspects of air pollution whether air quality or climate change; and second to inform and persuade people about the changes needed. Business particularly needs an unambiguous legal and regulatory framework if it is to play its full part. If the Government fails in this regard, it will be left to future Governments to introduce penal, rapid and painful short term measures to meet rapidly approaching deadlines. In the much quoted phrase of Kevin Conrad, the delegate from Papua New Guinea at the recent Bali conference on climate change, “We seek your leadership. But, if for some reason you are not willing to lead, then leave it to the rest of us. Please get out of the way.” The UK needs a Government lead by Ministers who demonstrate the political will necessary to meet the challenges of air pollution whether in respect of air quality or climate change. CCAL urges the Government to grasp the opportunity offered by London 2012 and underpin the UK’s commitment to deliver the “Greenest Games”. This opportunity can be grasped if acted upon now, with four years to go, and will surely be lost if action is delayed. Please reply personally to this letter, particularly given the personal commitment shown to this issue by London’s political leaders, to the email address provided separately.